Did columnist Paul Krugman help topple the French government? Did Paul Krugman help topple the French government? According to Business Insider's Rob Wile, the New York Times columnist "deserves some of the blame". The proximate cause of French President Francois Hollande's decision to call on PM Manuel Valls to form a new government was when two senior ministers criticised the nation's economic austerity policies. Mr Holland has requested that the prime minister form a new cabinet - certainly without the two offending officials - by Tuesday. That's not my observation, that's the diagnosis of financial institutions across the world, starting with the IMF which, whose director, Christine Lagarde, warned European leaders about an excess of budget consolidation. 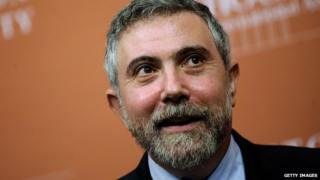 Paul Krugman, a Nobel laureate, also wrote on Aug. 13, "The nightmare scenario in Europe is not a hypothetical. The news that industrial production has ground to a halt raises the prospect of a new recession in Europe - its primary cause, austerity." These warnings have also been sounded by other leaders of world powers including Barack Obama. Krugman's full blog post condemns Europe's austerity drive and says that there is "good reason to fear yet another slide into recession" for the continent. He goes on to compare the economic outlooks for Europe and the US, which underwent less budgetary belt-tightening. He also says Europe's "fundamentals are considerably worse", including an ageing population and inadequate capital investment. The outlook for Europe, he concludes, "is quite scary". At this point, it seems, at least some now-former French officials agree. The money behind Hamas - Qatar is the most prominent supporter of the Palestinian group Hamas, writes Israel's Ambassador to the US Ron Prosor. There will be no lasting peace in Gaza, he says, until the flow of financial support from this "Club Med for terrorists" is cut off. "Qatar has spared no cost to dress up its country as a liberal, progressive society, yet at its core, the micro monarchy is aggressively financing radical Islamist movements," Mr Prosor writes in the New York Times. He goes on to question the decision to award the Persian Gulf nation the 2022 World Cup. Qatar must be isolated until it changes its foreign policy, he concludes, even if that is an "uncomfortable prospect" for many Western nations. A culture of abuse - The recent death of a South Korean soldier, identified by the media as PFC Yoon, has led to calls for a review of bullying in the nation's armed forces. Yoon's fellow soldiers allegedly beat and demeaned him repeatedly for more than a month. According to South Korean schoolteacher Choi Tae-hwan, writing in the Korea Times, the conditions in the military have their roots in the bullying culture that pervades Korean schools. The solution, he writes, is for educating the nation's youth at an early age to be more considerate of others. A "suppressive crackdown" on bullying and stopgap remedies are not enough if the real causes - such as a lack of morality and humility - are not addressed, he argues. A Chaldean genocide - The Christian population in Iraq, which once numbered more than 1.4 million is now down to fewer than 500,000. The nation's Chaldean population, writes John Paul Kuriakuz in the Wall Street Journal, is facing death or exile from its ancestral homeland. The former executive director of the Chaldean Assyrian Syriac Council of America says that while US airstrikes on militants led by the Islamic State of Iraq and the Levant (ISIS) have helped, they are not enough. "Targeted by ISIS for their Christian faith, Chaldeans and Assyrians are the victims of an unabashed ethnic-cleansing campaign," he writes. The fate of the Iraqi Christians is in the hands of Western leaders who seem reluctant to acknowledge a "genocide in the making", he concludes. That must change. Time running out for kidnapped girls - It is only a matter of time before the more than 200 girls kidnapped in Nigeria succumb to Stockholm Syndrome and begin sympathising with their captors, writes Henry Onyekuru in the Vanguard. "The government is acting too slowly in this situation and those girls are drifting far away from the values that they have been brought up with," he writes. The Nigerian government must do whatever it takes, including prisoner release, to free the girls before their minds are irrevocably twisted, he says. Onyekuru goes on to write that the entire Nigerian population is, in a way, being held captive by a corrupt government that has created civil strife by neglecting basic education and care of their citizens. On 24 August, Iran's Islamic Revolution Guards Corps claimed that it had shot down an Israeli reconnaissance drone over the Natanz nuclear facility in Esfahan Province. "Iran, better than any other regional country, knows about its overt and covert enemies and their offensive policies, so its defence doctrine is based only on protecting its national interests... Iran does not have countless fighters, aircraft carriers with atomic ships or nuclear missiles, because it never thinks about going on the attack.